HomeSmall Business BlogEntrepreneurshipBusiness OwnershipWhy have Team Building Activities Become so Popular Nowadays? Those confident in leadership roles will tend to come to the fore, but without any official hierarchy in place the process develops organically throughout the team. Cooperation is the ultimate factor in creating successful team building activities and relationships quickly form around the most efficient means of working together. This will also help to identify some of the less confident team members and encourage the group to work together in bringing them to the fore. 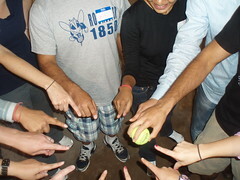 The team building activities will make people become more intuitively aware of others’ capabilities. This knowledge can be used to more effectively apportion work to those most capable and provide help to those most in need of it. Through this process of internal team building not only will the team become a self-sustaining entity, but it will allow for increased understanding between participants. This understanding will also go in to defining suitable tasks and setting achievable and desirable goals within the group. Problems are identified sooner and solved more quickly thanks to the group formation brought about in the team building activities. Productivity will also be reformulated and moved away from individual achievement towards group achievement which not only provides a more sustainable and healthy environment but has also been shown to benefit efficiency overall. This “productivity” need not be office-related, but is equally applicable to reaching desired learning targets and achieving mutually desired purposes: from creative arts classes to support groups. As you can see, there are a number of ways in which team building activities bring individuals together not only in terms of knowing each other better but also in terms of accentuating natural cooperation and improving working methods as a group. The three examples identified above should be considered as part of a self-sustaining process that snowballs the more effectively the group cooperate: streamlining equals better goal orientation which in turn equals greater productivity which, by providing a shared sense of accomplishment, results in better streamlining and so on. So now you know the secret of team building activities and some of the reasons they have become so popular. Namely, that they work! Simpleweb | Can Regular Days Out Motivate Your Team? How Much Does Time Matter to a Small Business Owner?